The experience of drinking whisky is elevated immensely when shared with another person. Logic dictates therefore, that it improves further when shared with multiple people. And that concept was proved to be correct when we put out the call to our whisky drinking friends that some much esteemed single malts and much loved blends were lined up on the bar, ready to be sampled. All our merry band required was a name, so inspired by our detractors (namely: the girls, who claimed we spouted streams of absolute smack whilst under the influence of the water of life) we formed the: Whisky Appreciation and Nosing Collective. The first night we held was a quiet success. After a visit to our local distillery Hellyers Road (how fantastic is it to have a local distillery?! 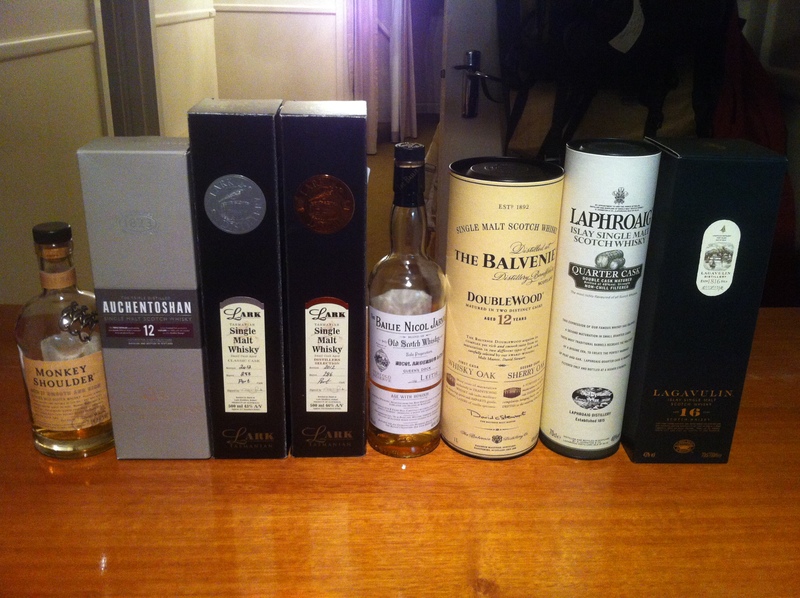 ), we settled in to a night of tasting Scottish and Tasmanian whisky. There were many stand-out drops, including the two Lark single malts, as well as the surprisingly impressive Balvenie Doublewood. The highlight of the night, however, was the unveiling of our two new and expensive purchases, in my case, the Laphroaig Quarter Cask, and in Ted’s case, the Lagavulin 16 year old. In hindsight, we probably sampled these in the wrong order. The overpowering peat of the Laphroaig was a revelation coming straight from a finely balanced Speyside single malt. The Lagavulin, on the other hand, was equally appreciated, although some of its complex subtleties may have been lost on the night. Come bedtime, with our heads slightly spinning, we could not decide which our favourite was. Fast forward to the present day, and it is still a debate that rages. Though we are now armed with more knowledge than we possessed in those formative days of our whisky drinking, we still struggle to separate these two distinctive Islay malts. This serves as proof that information and experience are not crucial to the enjoyment of whisky: it is simply how it makes you feel in one particular moment. And on this night, that particular feeling was pure elation. ← Ardbeg returns from space!